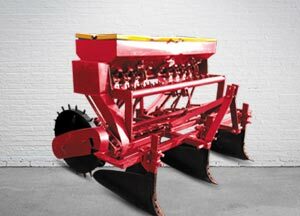 It performs four function at a time, i.e., marketing beds, furrow, applying seeds and spreading fertilizer. It forms two beds and three furrows in single operation and performs better weed control. This implement forms flat bed to address salt stress and provides better water management and fertilizer use efficiency. It is provided with placer wheel fir the Placement of seed of proper depth.